Very innovative! I have been bookmarking various pages and threads regarding the alternator conversion just in case there comes a day. Will be keeping this one as well. Congrats!! Very innovative! I have been bookmarking various pages and threads regarding the alternator conversion just in case there comes a day. Will be keeping this one as well. Congrats! Me too ..... but pics don't "open up" for me? Where is the best place to get a pully for this conversion at a decent price? I got my crank pulley at an alternator shop, if thirty bucks is a good price. I doubt that though. I used a new v-belt alternator. After I measured I came up with 2.65 inches as the largest pulley I could use and still get the inner cover bolt passed the pulley. People will jump in and say that is not big enough. I don't live in the city though. If you plan on being stuck in traffic for great length's of time with the headlight on, I'd say go bigger. I raised the idle to 1100 rpm to help with the charging rate at idle. The problem is, there is no standard pulley, and depends on the alternator pulley you use. make another post and then go back and see if the pictures show up. if they don't, give me a phone call and I will work with your setup. And has anyone used a Weasler Engineering pulley? Those are available at Tractor Supply. What's slick about those, is that you pick your sizes, and weld them together. I too have long been planning to install a 55 Amp car Alternator (like a PoorBoyMod). Looks like I'm gonna be staying in the house out of public and away from germs if possible for the most part this winter (excellent prognosis, just have to avoid certain risks) so maybe I will tackle it this winter. 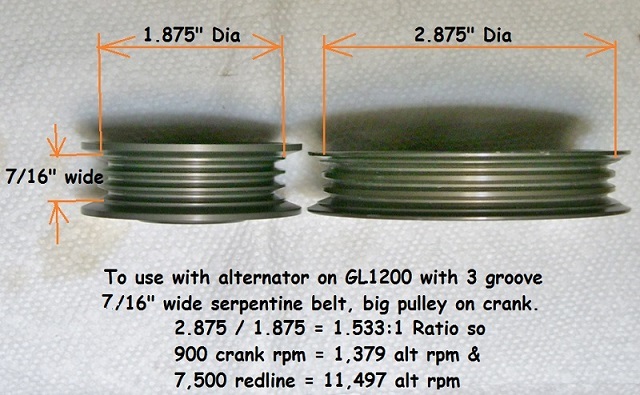 I have a newly remanufactured in box still # AL-240 (crosses to a Duralast 14824) that is a 55 amp Suzuki alt with a maybe 2-1/2" V belt pulley (my plan is to leave my still working OEM style charging system in place, just disconnected at stator plug & reg/rec .... as a back up) intended for like 1984-1994 Suzuki Samurai 1.3 lt. I can and do weld. I even have a spare timing belt cover set as well as spare fan (& radiator for what it's worth). Got both pulleys finally, the smaller one was from Ebay, the larger one from the seller's site. Got both for a total of about $27 with shipping. Pics have details. 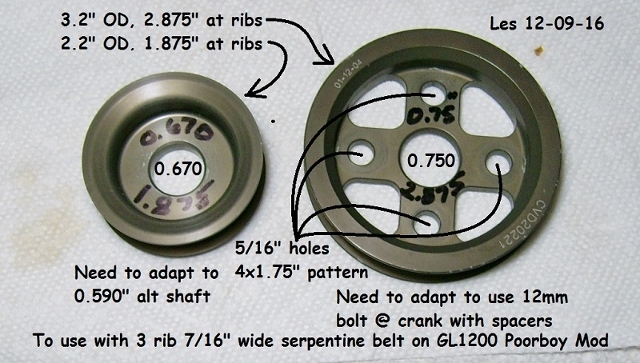 CV Products offers the most comprehensive line of V-belt Pulleys and Drive Components in the racing industry! CV pulleys are fully CNC-machined to precise tolerances from premium 6061-T6 billet aluminum to ensure the highest quality. All pulleys feature a mil-spec hard anodized coating that delivers long-term reliability and greater service life. I will have to adapt them to use.